Imagine being able to highlight the best moments from your wedding and honeymoon in your own bound book. Printing your own wedding book is a great way to capture the memories of one of the most important days of your life! Your wedding book can also be used for your wedding day! We have had many of our brides create wedding books for use as favors at their weddings or along with their table centerpieces. You can also create wedding books as a thank you for your friends and family who helped make your wedding day as special as it was! Wedding Book Publishing : Include photographs of you and your intended and/or pictures of those people attending your wedding. We can create areas for your guests to sign their names and give their best wishes. The best part about a personalized guest book is that once the wedding is over, you will have a beautiful wedding guest book full of pictures and signatures which you can cherish always. You can even have each person sign your book next to their photograph! Our wedding memory books also make great favors. They make an excellent way for you to thank all of your guests for coming as well as show them the huge part they have played in your lives. A wedding book favor is something that your guests will also always cherish and it makes such a wonderfully personal gift. We can create your book in any size or shape so you can create small wedding book favors or large ones! Our wedding books also make wonderful conversation pieces and many of our customers have used them as centerpiece add-ons. Include photographs of all the people attending your wedding and then place the book at each table and watch the conversations ensue. These wedding books make a great way to break the ice for guests who might not know one another. 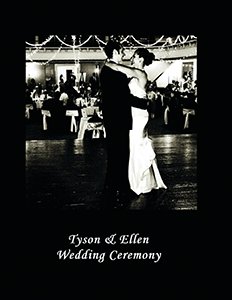 Create a book that contains all the photos from your wedding and honeymoon. This is a great way to keep track of all those loose photos and it is a wonderful way to remember every detail you're your wedding and your honeymoon. Create a wedding memory book and give one to all of your attendants as a way of thanking them for the huge part they played in your wedding.